Today's guide on how to install Android 5.0 Lollipop on Nexus 4 Smartphone is going to be brief. Of course you should know the great benefits of installing android 5.0 Lollipop on your nexus 4 device. Check out more about android 5.0 Lollipop, and things you need to know about it. Previously, I published a guide on how to install android 5.0 lollipop on Nexus 5 and Nexus 7 smartphones and I know that by now, Nexus 5 and Nexus 7 users would be enjoying the upgrade on their smartphones. Below explains a brief guide on how to install android 5.0 lollipop on Nexus 4 smartphones. Step 2: After you have successfully performed the above step, then remember to unlock the boot-loader of your Nexus 4 smartphone. If you have unlocked it before, then skip this step and move to the next. Step 3: Download the ADB and Fastboot files and then extract the folder to your desktop screen. Step 5: Then copy all the files mentioned above and paste them in the ADB folder you extracted to your desktop screen which was initiated in step 3. Step 6: Once you have successfully copied the files, then enable USB debugging mode on your Nexus 4 device. To enable USB debugging mode on your Nexus 4 device, simply move to Settings >> About Phone >> Build Number (Tap it 7times), by doing so, it would unhidden the developers option. Then enable USB debugging in the developers option. Step 7: Once you have enabled USB debugging on your Nexus 4 device, the connect your device to the PC. 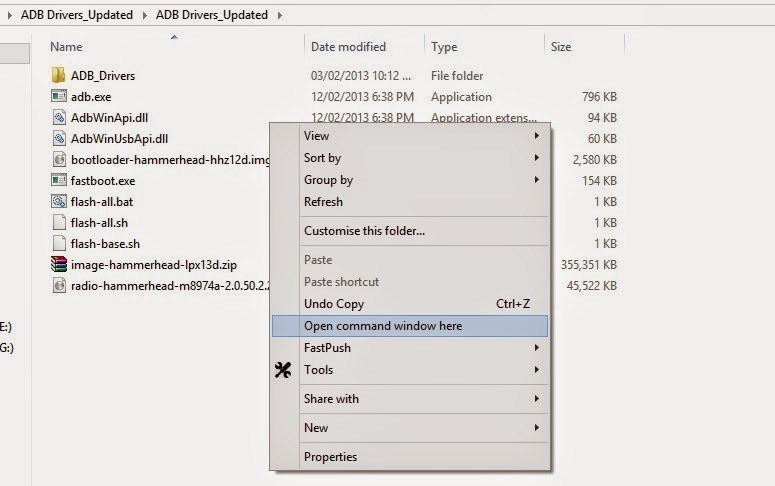 And on your PC, open the comand prompt windows on the ADB folder. To do so, simply hold the shift button on the keyboard of your PC and Right click on the white space of the folder, then click on “Open Command Window here”. Of course, the below image gives a clear picture of what I mean. Step 8: Once you have open the command prompt, then enter the below command on your windows. NB: The above command helps to bring out the list of connected device, if your device is listed, then you are good to go, but if not, then check your drivers if it's installed properly. Step 9: Then once your windows is in fastboot mode, simply run the below command. 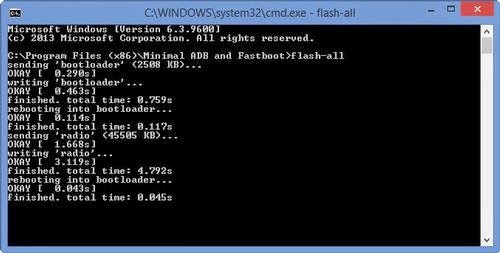 Step 10: Once you have input the above command prompt, simply move to the ADB folder you extracted to your desktop screen, and locate and click on the "flash-all" file, and the installation process would begin. Step 11: Once the installation begins, you would see alternating downloading, writing, erasing just as shown in the image below. Step 12: When the installation process is completed, then your Nexus 4 device would reboot. At this time, you can now disconnect your device from your computer. 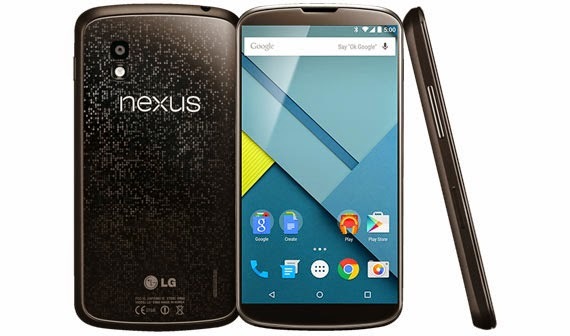 Once the reboot is completed, your Nexus 4 device would start running Android 5.0 Lollipop. Hope this brief tutorial helps. If you encounter any form of difficulty during the process of installation, please do let us know, and we won't hesitate to tackle the problem at once. If you find the tutorial useful, then Like & Share it with your social friends. The social buttons below can be very useful. I would also appreciate your tweets about this tutorial.